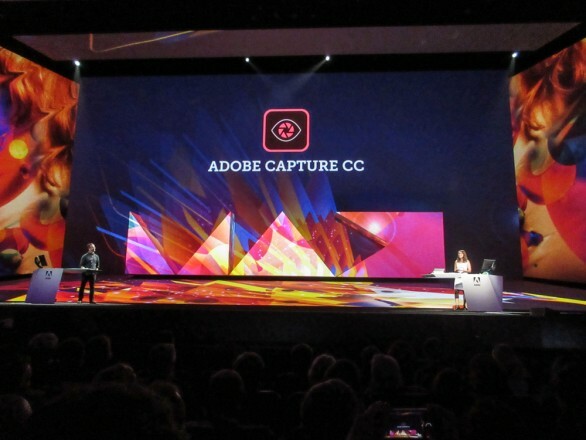 Earlier today at 9:30 PST, the first Opening Session (or keynote) took place at The Microsoft Theater in Los Angeles as Adobe MAX officially kicked off their annual convention. 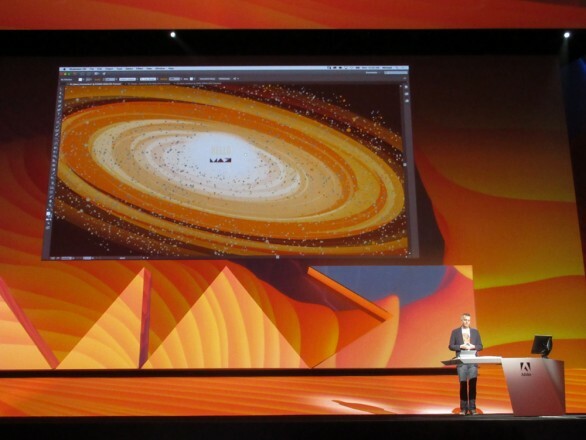 Adobe MAX is known for creating immersive experiences at their Opening Sessions with incredible sound and video screens that encompass all sides of the stage. 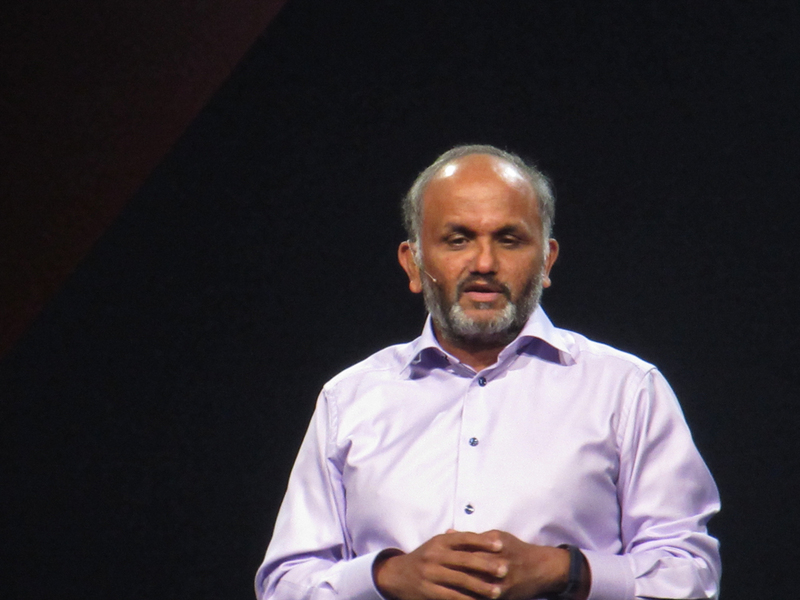 The first Adobe executive to take the stage was CEO Shantanu Narayen, who jokingly said that the opening stinger keeps getting better every year, and that he could absolutely guarantee that everything was created using Adobe products. Narayen went on to say that this MAX had set a new attendance record with nearly 7,000 people from around the world. The theme permeating this year’s MAX is connectivity; not just of all your desktop and mobile devices, but also of all your assets and creative collaborations with your colleagues. 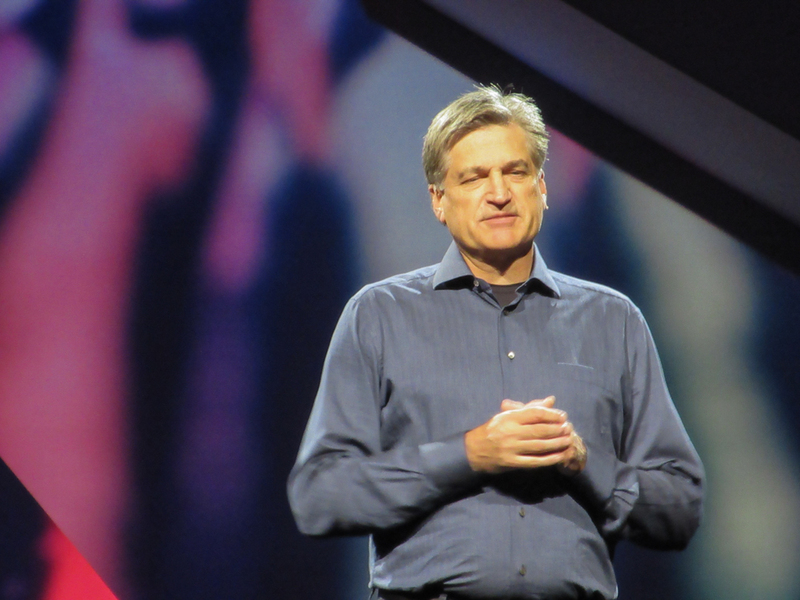 He said that Creative Cloud is up to 3.5 million users. 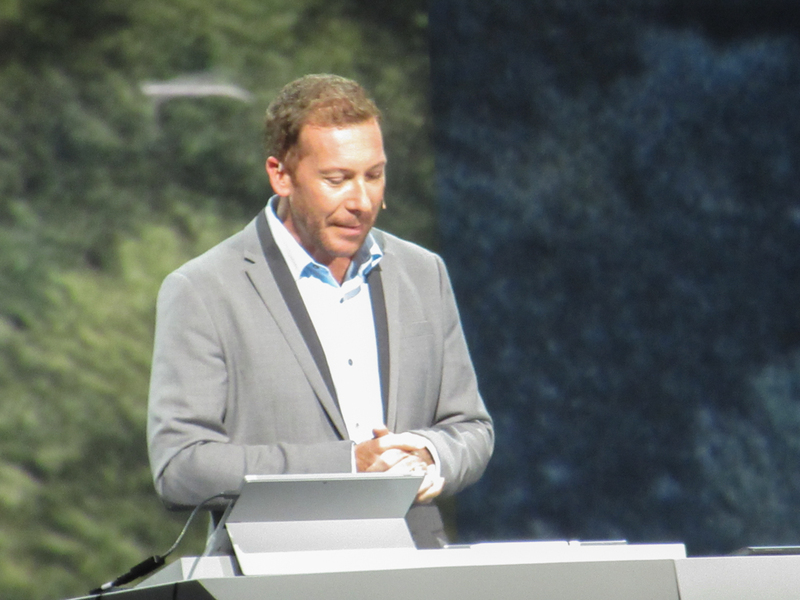 Narayan then introduced the host of the Opening Session, Bryan Lamkin—SVP & General Manager, Creative Cloud. Lamkin identified three key areas for creatives: design is paramount, it’s a multi-screen world, and there’s a strong demand for a personalized experience. And all of this has to be created faster than ever. CreativeSync is one of the features that Adobe seems to be the most excited about because of its power to keep everything and everyone connected during the creative process. Lamkin introduced Scott Belsky to tell attendees about CreativeSync. 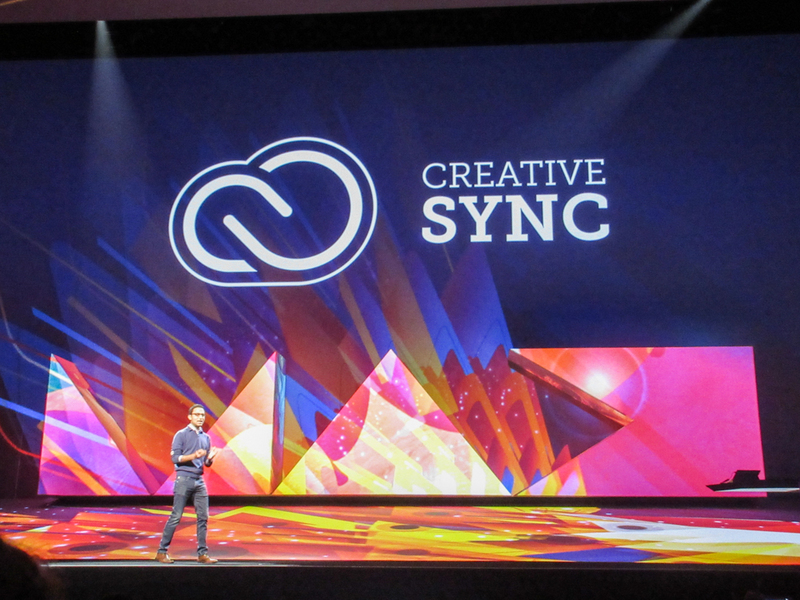 He explained how CreativeSync connects your assets, including fonts, through Creative Libraries in your apps from desktop to mobile and vice versa and now even mobile to mobile. These files can also be shared with other individuals and teams for creative collaboration. CreativeSync also gives you access to Adobe Stock. Eric Snowden and Jenn Tardif came on stage to demonstrate the power of CreativeSync by passing assets back and forth to create a poster for a yoga workshop. They used a variety of desktop and mobile apps that included Photoshop, Adobe Stock, Comp CC, Photoshop Sketch, and Adobe Capture CC. Capture CC is a brand-new app that combines Adobe’s Color, Shape, Brush, and Hue mobile apps into a single app. Now you can create color themes, vector shapes, and brushes all from the same app. Up next was Michael Ninness to talk about some new features that designers could get excited about, starting with Adobe Illustrator. He demonstrated how much faster Illustrator CC 2015 is compared to older versions. In previous versions, you could only zoom in to 6,400%; now you can zoom in to 64,000%. He then went on to demonstrate improved touch capabilities to create simple shapes that he manipulated using the brand-new Shaper tool. The shapes created by the Shaper tool are live shapes and can be edited at any time. Ninness continued his demo in InDesign. He showed how CreativeSync could be used to update placed Illustrator files and how paragraph styles can be shared between programs. A really nice new feature in InDesign has to do with OpenType fonts, which often have alternate glyphs for a letter. Now in InDesign when you highlight a single letter, you immediately see the alternate glyphs that you can choose from. Just click the glyph you want to use. Also in InDesign is a new feature called Publish Online. This allows you to digitally publish your documents without using a plug-in. This includes any animations or interactivity that you build into your files in InDesign. Adobe introduced another new program today called Adobe Fuse CC. This application lets you create fully customizable 3D characters that you can import into Adobe Photoshop using Creative Cloud Libraries. Once in Photoshop you can pick from a list of poses for your character. These poses are actually animated, so you can scrub through the animation to find the exact pose you need. You can also adjust the position of the character in 3D space and change the lighting. Zorana Gee took the stage to talk about Photoshop. She demonstrated using artboards to design for screens of various sizes. One of the biggest artboard improvements is being able to see only the layers for the currently active artboard. Photoshop also now supports SVG files. Finally, you can now also export multiple layers with each layer being scaled to a different percentage. 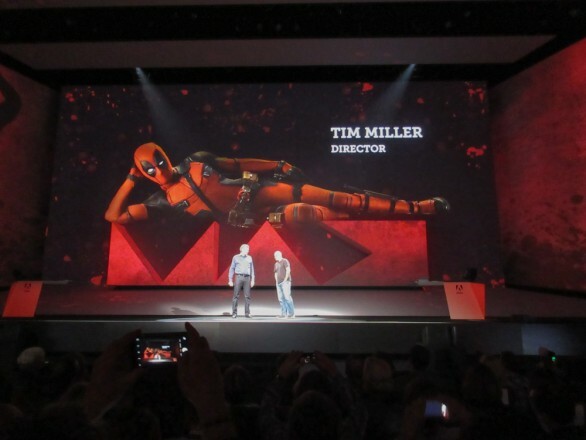 One of the biggest surprises at the Opening Session was the appearance of Tim Miller, the director of the upcoming movie Deadpool staring Ryan Reynolds. Lamkin and Miller had a conversation on stage discussing Miller’s use of Adobe products in the making of the movie. Miller is a huge comic-book fan and said that he has a giant two-story wall at his studio of all the comics he’s collected the past 30 years as a testament to how nerdy he is. Adobe showed a lot more at the Opening Session but I want to wrap it up with the new features they showed for photographers. One of our longtime friends Bryan O’Neil Hughes took the stage for these demos. Bryan is Adobe’s Principle Product Manager, Digital Imaging for Photoshop. Bryan started with Lightroom mobile. He was showing it on a new iPad Pro (which isn’t available yet). Lightroom mobile now has the Dehaze feature that was recently introduced in the desktop version of Lightroom. He then demoed Photoshop Mix, a mobile app that has been completely re-engineered from the ground up. He showed an example of masking images into people and using blend modes to blend the two images together. Mix now also has twice as many tonal adjustments to help blend composited images. He then introduced a brand-new mobile app called Photoshop Fix where he showed familiar retouching tools from the desktop version, but these tools have been completely reimagined for the mobile app. These tools include a Spot healing tool, a Healing brush tool, a Patch tool, a Clone Stamp tool, and Liquify. The Creative Cloud Photography plan, which costs $9.99 a month, now includes Photoshop, Lightroom, Lightroom mobile, Photoshop Mix, and Photoshop Fix. For more on all of the other announcements from Adobe today, visit http://www.adobe.com.